Update October 19, 2016: Microsoft have contacted us to clarify Dan Ayoub’s quotes regarding cross play in Halo Wars 2 – turns out they’re looking into cross play for future releases, not Halo Wars 2 itself. So you can see where we got that idea. Anyway: not this time, sadly. Original story: Back in June, 343 Industries strategy boss Dan Ayoubtold Eurogamerthat Halo Wars 2 wouldn’t be getting cross-platform play between the PC and Xbox One. Now, however, things are looking a bit more rosey. Related: our impressions ofHalo Wars 2’s Blitz mode. In an interview with PCGN, Ayoub told us that cross play is a feature that’s still being considered. Ayoub said: “Quite frankly it was a time issue. We didn’t have time to crack all the nuts and bolts to making cross play work in time for launch, but it’s something we’re certainly looking into”. Ayoub is also upbeat about the technicalities of PC and Xbox One gamers playing Halo Wars 2 together, putting to bed the murmurs that cross play was dropped due to the natural advantages of a keyboard-and-mouse over gamepad. 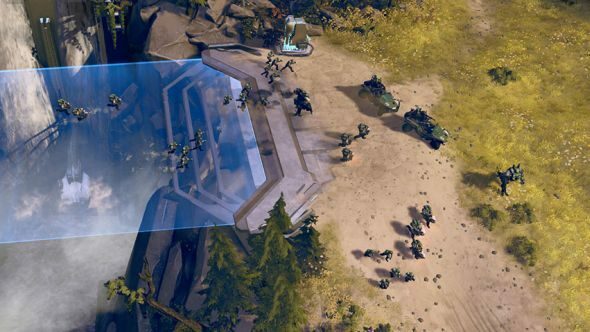 It’s already been confirmed that the entire Halo Wars 2 campaign will be playable in co-op, as will the Skirmish multiplayer mode and the weird, wonderful card-based Blitz mode, so there are plenty of options. Another strong case for cross-platform co-op is that us PC players can always blame defeat on those ‘damn XBO kids with their bloody controllers’. As for competitive cross play, they could always take the Gears of War 4 approach of letting people play cross-platform games on private servers. Give that Halo Wars 2 is an RTS game and therefore exactly the type of game that deserves keyboard and mouse support, I also asked Ayoub whether that’s a feature we could see added to the XO version of Halo Wars 2 down the line.